Am 22. und 23. November findet in Warschau das MANIFEST FEST statt, ein Festival zu Ehren Ken Garlands und seines 1964 veröffentlichten Manifests „First Things First”. Es wird Diskussionen, Vorträge und Performances geben, die die heutige Rolle des Designers und seiner sozialen Verantwortung thematisieren. Aus dem Pressetext: London, 1964 – Ken Garland, a graphic designer, publishes his manifesto „First Things First”. The manifesto soon becomes widely known and famous, not only among graphic design and advertising agencies communities. The document is published in the Guardian Newspaper and Ken Garland is invited to appear on the nationwide TV programme. In a rich and affluent Great Britain of the sixties, during the consumerism era, no one would rather believe that a designer might come up with something more serious than corporate identity or another commercial. Since the publication of Garland’s manifesto the “First Things First” watchword becomes a synonym for socially responsible design involved into vital environmental, social and cultural issues, highlighting human dimension to graphic design theory. In 2000, American and British graphic designers communities, actively devoted to the idea of socially responsible design, come to the conclusion that postulates presented in the 1964 manifesto and referring to the essential changes in the idea of graphic design are still up-to-date. Rick Poynor, a British design critic collects signatures to republish the new, improved version of the manifesto. Simultaneously Western European and American design magazines publish the “First Things First 2000” document. Warsaw, 2014 – 50 years after the publication of Ken Garland’s “First Things First” manifesto. The most outstanding designers and critics from Europe and the United States will meet in the Stanisław Witkiewicz Studio Theatre to discuss postulates presented in 1964 and in 2000. They will carefully reflect on how to benefit from design in a contemporary world and how to make it more effective in social and political aspects. Ken Garland will be a guest of honour of MANIFEST FEST. MANIFEST FEST intends to rethink the idea of socially responsible design from a completely new perspective. 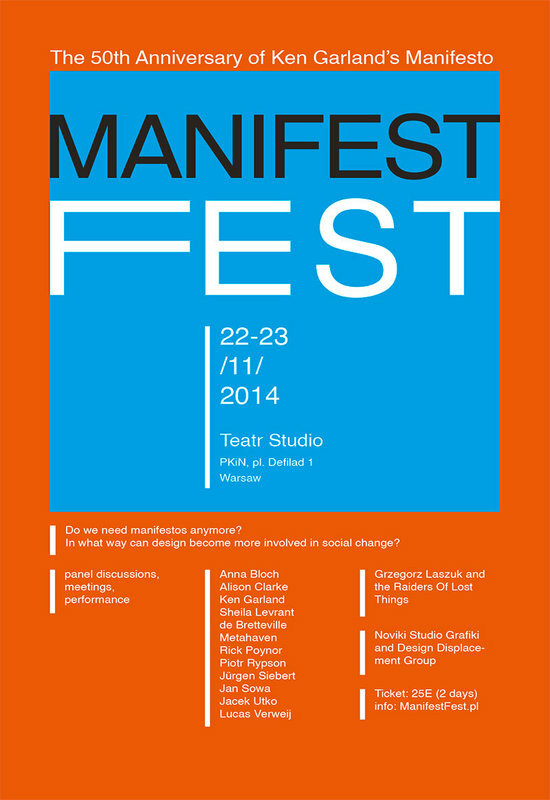 MANIFEST FEST is a two-day meeting, a series of seminars and panel discussions aiming to debate and eventually develop further projects’ scenarios accompanied by a dedicated set of projects that will be installed in the Studio Theatre’s space and in its vicinity. The premiere of the Raiders of the Lost Things by Grzegorz Laszuk and Komuna//Warszawa (Warszawa Commune) also will take place during Manifest Fest. The performance will reveal what happens to the „First Things First” manifesto in the distant future. 17.00 – Sheila Levrant de Bretteville, Piotr Rypson, Jan Sowa, Lucas Verweij, Jacek Utko discussion: Citizen-designer or participatory design? Who is in charge of making things work? Design Critique Platform is involved in the production and support of knowledge and critical reflection on the topic of contemporary design and visual culture in Central and Eastern Europe. Its activities transcend the traditional division of culture between high and low, or official and vernacular – they concentrate on design understood as a cultural practice and an emanation of social, political and economic tendencies and phenomena. The Design Critique Platform’s initiatives include organizing exhibitions, conferences and lectures, studying design and visual culture, and publishing texts and books.